2018 BMW F 800 GS Adventure TE. Picture credits - BMW. Submit more pictures. Powered by the dynamic parallel twin engine with an output of 63 kW (85 bhp), the F 800 GS Adventure has no problem whatsoever leaving civilisation far behind it. With a torque of 83 Nm at 5,750 rpm, this enduro bike has sufficient reserves to supremely tackle any off-road challenge - however remote the location. Wheels: Spoke wheels. Either On-Road or Off-Road tyres. Comments: Small windscreen. Ride-By-Wire. Riding Modes Pro Enduro/Enduro Pro in addition to Rain and Road. Electronic Suspension Adjustment. Ask questions Join the 18 BMW F 800 GS Adventure TE discussion group or the general BMW discussion group. Bikez has discussion forums for every bike. 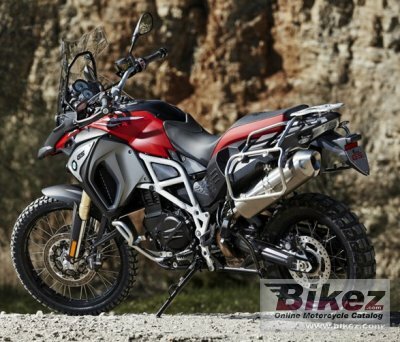 View comments, questions and answers at the 2018 BMW F 800 GS Adventure TE discussion group. You can sign up for e-mail notifications when other riders answer you. If you have extensive experience with the MC, please send us a review. If you consider buying this bike, you should view the list of related motorbikes Look at photos. Compare technical specs. And check out the rating of the bike's engine performance, reliability, repair costs, etc. You can compare the rating with other bikes.